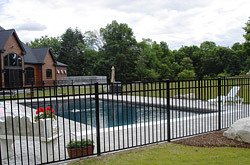 One of the main functions of fencing is for security purposes. It also gives you a sense of privacy and sets the boundaries between yours and other properties. We would agree that it is a very important role to play, so all the more reason for fences to be durable and reliable. 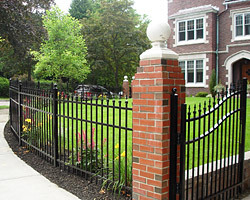 At Krefta Landscape we have been installing fencing for our residential and commercial clients throughout the Eastern Massachusetts region for many years, and with great success! 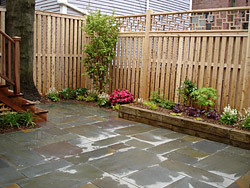 The professional team at Krefta Landscape will custom design and install your fencing for you. 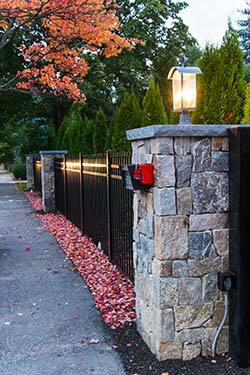 We believe that fences don't have to look mundane, plain and boring. Take a look through our project gallery and have a look at some of the beautiful fencing that we have installed for our very satisfied customers. One of our trained contractors will come out to your property and provide you with a free estimate on your project. Our designers can help you come up with a fence that will also enhance the look of your property as well as its function. Working with an experienced company means that you have all the resources and assistance necessary to get the best installation possible. It really is a win win situation; you can't go wrong with the installation of professional fencing by the team at Krefta Landscape. It is also important to choose the right type of material for every landscape project you plan to undertake. The reason is that selecting the correct material for your property can be a significant factor in the longevity of the project. In other words, using wood for a fence may not be right for your property and you may get a lot more use out of a vinyl fence. This is where the advice of the professionals really comes in handy. So let us help you make the right choice and talk to one of our team members today. We provide you with a free consultation and get you on the road to a safer and more private property! Contact us today and let's get started!